Smith’s history of America is not what is sometimes called “triumphalist” history, meaning a history that celebrates everything American without being overly critical, even when criticism is warranted. Smith presents the American story without pulling any punches, warts and all, as it were. In the process he takes on some American myths and puts them to rest. Despite Smith’s rather positive description above, he understands that the settlement of America was neither easy nor simple—the forces that brought colonists from Europe were complex, as were the many changes that being in a new, alien environment engendered in the colonists. The odds were high that those brave souls would meet an early death, either during the dangerous sea voyage—when storms often alternated with periods of little wind, when food and water would go bad and sickness rampaged through the passenger holds—or from disease, Indian attack, or even starvation once they arrived in the New World. They came for a variety of reasons, but all wanted a better life. Carving a better life out of the vast wilderness the early colonists found in North America challenged even the hardiest of those early pioneers. The Spanish, Portuguese, and English were not the first Europeans to come to North America. As far as is known, the first to arrive on the continent of North America were from Scandinavia. The Norse explorer Eric the Red traveled through Greenland and founded a settlement around the year 985. His son Leif Ericsson also explored the area of what is now Northeastern Canada and spent some time in that region. It is possible that Viking explorers sailed farther south along the Atlantic coast, perhaps as far as the Caribbean islands. Some evidence has been found in North and South America to suggest that other contacts occurred between North America and explorers from either Europe or Asia, but all such ideas remain in the realm of speculation pending further evidence. In any case, Columbus's journeys traditionally mark the beginning of the period of European settlement of the New World. John Cabot, Amerigo Vespucci, Ponce de León and others soon established territorial claims for Spain and Portugal, and Vespucci's name was eventually attached to the continents of the New World. (He probably had a better publicist than Columbus.) But Columbus was the first to arrive after 1400. The great irony of Christopher Columbus, of course, is that he never really knew what he had discovered; indeed, he never set foot on the continent of North America. Yet the first explorations of the area that eventually became the United States started from the Spanish settlements begun by Columbus in the Caribbean. The oldest settlement in North America is the city of St. Augustine in Florida. Spanish explorers such as Hernando De Soto and Francisco Coronado ventured widely into the southeastern and central parts of North America and as far west as Colorado and the Grand Canyon. It was Coronado’s men who introduced the plains Indians to the horse, which, as stated elsewhere, resulted in a remarkable transformation of their culture. Other Europeans such as Giovanni da Verrazano sailed along the east coast as far as New York harbor, and Frenchman Jacques Cartier sailed into the St. Lawrence River, establishing the French claims on what became Canada. General. In the broadest sense the American colonial experience was not unique in history. Following the discovery of the New World by Columbus, the European nations—primarily Spain, Portugal, Netherlands, France, and England—set out to build colonial empires based on certain assumptions: First, colonies would make them wealthy and powerful and give them advantages over their neighbors. Second, the acquisition of colonies would enable them to solve various social problems such as overpopulation (relative to available land and food supplies), poverty, and the crime that was often associated with chronic lack of work for the unemployable poor. Third, a general sense prevailed among prosperous members of society that since the poorer classes knew they had little chance of improving their lives, which might tend to make them rebellious, colonies could serve as a sort of escape valve for pent-up frustrations. Whatever the motivations, most major European nations vigorously pursued colonial policies. The North American colonies were English for the most part, excepting Spanish Florida and French Canada. But those English colonies included numerous immigrants from other nations. Along the Delaware River was a small colony known for a time as New Sweden, and in parts of Pennsylvania there were more German settlers than English. French Huguenots came as well, and the New York colony started as the Dutch colony of New Amsterdam. Within the English communities one could find diversity of another sort—Puritan Congregationalists in New England, Catholics in Maryland, Anglicans in Virginia and the other southern colonies, Presbyterians in the regions settled by Scottish and Irish Protestants from Ulster (Northern Ireland), Jews in Rhode Island, Quakers in Pennsylvania, along with German pietists, and a smattering of Methodists, Baptists, and other Protestant sects throughout moat of the colonies. Religious differences were more important than they are in the United States today, and were often the source of conflict. No matter the religious or ethnic makeup of each colony, whether they were proprietary colonies governed by entities such as the London Company, or Crown colonies under the direct control of the British government, all were governed according to British law. We have already discussed the push-pull factor, forces operating in both directions, east and west. The English and other colonists who came to America voluntarily came for different reasons, but virtually all could be boiled down to one essential point: They wanted to improve their lives. Behind that self-evident fact was the additional idea that they had different backgrounds and different primary motivations. Some were seeking economic advantage—most of all, a chance to become landowners. The decision to emigrate was also often spurred by conditions in England and elsewhere in Europe—during times of strife or economic hardship, the impetus for emigration was stronger than in good, stable times. Some emigrants were moderately prosperous, and saw the New World as an opportunity for investment that would allow them to move up a few notches on the economic scale. In general, however, the very well-to-do did not emigrate because they had everything to lose and could gain only at great risk. The very poor did not come at first because they had nothing to offer—no skills, no money for passage, and so on. To obtain a contract as an indentured servant, one had to have something to offer—a skill such as blacksmithing or farm experience or the price of passage—so the poorest of the poor, who were generally chronically unemployed and had no skills to speak of, tended not to be among those who came voluntarily. Later many poor people came against their will—some were prisoners who were offered a chance to go to America in lieu of a prison sentence, and others came as indentured servants, some sold into that temporary form of servitude by parents or families. Both convicts and indentured servants had a chance to succeed because labor was dear in America and they were valued far more than they might have been at home. Things began slowly. By 1620 maybe 2,500 colonists existed in all the English colonies in North America. 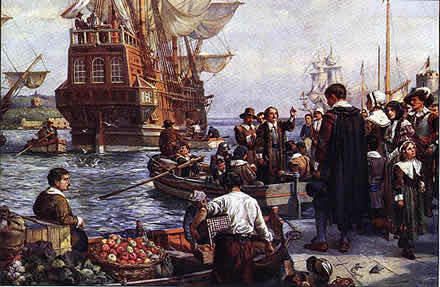 A great migration of Puritans and others occurred from 1630 to 1642. Because of the need for labor to “develop” America, as mentioned above, vigorous recruiting methods were used—inmates of jails and poorhouses were loaded into the ships. The fundamental economic fact about America was the opposite of what existed in Europe: America was land rich and labor starved—much of Europe almost an exact mirror image. Some settlers came to America for religious freedom, to be able to practice their faith as they wished. But as we shall see, however, the desire for religious freedom did not necessarily mean the desire to have everybody share that freedom. In Puritan Massachusetts, for example, members of other faiths were not welcome. And in Anglican Virginia, it was virtually impossible up to the time of the Revolution for a minister other than Anglican to obtain a license to preach. Maryland became a refuge for Catholics, and the religious diversity of Pennsylvania was an exception. By the time the first English colony in North America was established in Jamestown in 1607, Spain and Portugal had colonized much of what we now call Latin America, and French and Dutch settlements were being established in the Caribbean area as well as in East Asia and elsewhere around the globe. The French and Dutch began colonizing North America as well soon after Jamestown was settled. By the time of the American Revolution, Great Britain possessed thirty-one colonies around the world, including some—Canada, Florida, and New Netherlands, for example—wrested from colonial competitors such as France, Spain and Holland. Thus the American colonies in 1776 were but thirteen small parts of a vast colonial empire that had been growing since the 1500s. Acknowledging the debt Americans owe to the past, we can still assert that in many ways the American experience was unique, as are all national experiences. What brought about the American colonial experience? What was its character? What was the colonial experience really like? Imagine climbing aboard a ship in which you and about one hundred other people, mostly strangers, have not much more space than exists in your college classroom or perhaps a small house, carrying only as much personal property as you can fit into a medium sized suitcase. You sit in that ship in port for days or even weeks until suitable winds and tides take you out to sea, and then you toss and rock for more weeks or months, as food spoils, water becomes foul, people get sick and often die, storms threaten life and limb of everybody on board. If you survive that ordeal, you finally arrive on a distant shore, disembark with whatever provisions have not been ruined by saltwater, and set out to make yourself a life. Particularly in the earlier years of colonization, there was not much on those shores to greet you when you arrived. Try to place yourself in that time: Imagine: No hotel to check into, no shops in which to purchase what you need (even if you had money), no restaurants, hardware stores, or theaters—not even a 7-Eleven! But don’t sell yourself short—people are adaptable, and those hardy colonial souls would be completely unable to comprehend our world. The second point about the colonial experience has to do with the people who came. Of all the things that can be said about the settlers who came to America, one thing can be claimed without much fear of contradiction: Those who came differed from those who did not. The settlement of America was not easy; consider the warning at the top of the list of instructions provided to colonists heading to America, “Make Thy Will!” The odds were very high that those brave souls would meet an early death, either during the dangerous sea voyage—when storms often alternated with periods of little wind, when food and water would go bad and sickness rampaged through the passenger holds—or from disease, Indian attack, or other causes once they arrived in the New World. The risk of failure was unavoidable, but overriding the fears that such conditions engendered was hope of improvement, willingness to gamble, to bet one’s life on the chance of being able to make a fresh start. Those who were prepared to take the necessary risks came. Those who could not face those odds stayed home. We should remember that what happened in the colonial world two to three hundred years ago helped to shape us into the nation we are today. Those early colonists were our spiritual ancestors, and the things we admire in them are aspects of our own character that we would emphasize. Their flaws are often shared by us. If we wish to understand who we really are, we must know where we came from. The physical and emotional demands of colonization were such that one needed to be a certain type to try it—one had to be a bold, adventurous spirit, with a work ethic and a determination to prosper—and those traits became basic elements of the American character. In a real sense the broad outlines of the American experience were formed before the colonists left their homeland because of the differences between those who were willing to take that gamble and those who were not. Thus the first seeds of the American Revolution were planted among those early risk takers and their offspring. Summary. Many came voluntarily, many came under duress of some kind. (We will discuss the African experience, which brought thousands of slaves to the New World, below.) Those who came voluntarily thought they could make a better living. They dreamed of finding gold or silver, or of a life that would reward them in ways that were impossible in their circumstances at home. Some felt oppressed by political conditions that required obedience to king, duke or other landlord, which many found intolerable and which often involved involuntary military service. Those who came involuntarily, aside from African slaves who were brought to America, included prisoners, debtors, young people who were sold by their parents or people who sold themselves into indentured servitude. One method of addressing the problem of labor shortages in America was that of indentured servitude. An individual or a family wishing to migrate to America but lacking funds to pay for the voyage might offer their services by means of a labor contract under which they would agree to work for a specified period of time for whoever owned the contract. Such contracts were negotiable in the sense that they might be signed with the owner of a vessel heading to America who would then sell the contract to someone in need of labor. Needless to say, it was an imperfect system subject to various kinds of abuse. The experience of indentured servitude was as varied as the people who practiced it, either as owners of their servants’ time for a stipulated period or those whose time belonged to somebody else. Some indentured servants—say, a young married couple with skills to offer, the husband perhaps as a carpenter and the wife a seamstress—might make a decent bargain for themselves, and given a decent person for whom to work, come out of the experience with a little money, some land, an animal or two or perhaps a set of tools that they could use to start their own lives. Periods of service varied from two or three to seven years or more, depending on all kinds of variables. Quite often, possibly in the majority of cases, indentured servants found their lives less than ideal. Laws tended to protect the masters, punishments for laziness or attempting to run away were frequently harsh, and both men and women were subject to various kinds of abuse. For most, the period of indenture was most likely seen as a trial to be endured as best one could, with a reasonable hope of some sort of a stake in the future when the service was complete. In some cases, very warm relationships no doubt developed between servants and owners, and indentured servants might find themselves more or less adopted into the family, perhaps through marriage or formal or informal adoption. Whatever the odds may have been at any given time for any person or group, indentured service was a gamble. When the contracts were signed in Europe, those offering themselves for service had little knowledge or control over who might eventually buy those contracts. If they survived the voyage to America, they then had to go through a period of acclimatization, and if they were not brought down by diseases to which they had never been exposed, then they had at least several years of hard work before they could again call their lives their own. Two documents about the experience of indentured servants can be found on the Academic American web site and in the appendix for this section. Both of the above documentary descriptions of the lives of indentured servants present an extremely negative view of the experience. In many cases that description would have been accurate. But by no means should we conclude that all indentured servants’ lives were so afflicted. Brief mention is made of indentured servants in the film “The Last of the Mohicans”—the family of John and Alexandra Cameron, whose farm is attacked by Indians early in the movie. Most of the cases of indentured servants probably fell between the extremes of abusive, exploitative contract owners and those who, with a generous spirit, for all practical purposes adopted the indentures into their families. Where indentured servants got along well with the contract owners, both parties undoubtedly benefited. The host benefited from the labor provided by the indentured servants, and the indentured servants honed the skills they would need to survive on their own and built up some sort of equity upon which they could trade when their indenture was completed. We know little about the many individual cases of indentured servants, but we have a sense that many landowners in the later colonial period and in the years after the Revolution had risen from the ranks of those who temporarily sold their services to another person. The practice continued in somewhat modified forms well into the 19th century. Tenant farmers in the Reconstruction era had something like indentured contracts. And even in modern times, those who contract with an employer to provide services over a fixed period are entering into a similar type bargain. Many prisoners were also sent to America by the English courts, generally as a means of ridding the mother country of the chronically unemployable or incorrigibly criminal. So many were sent in one period, in fact, that the governor of Virginia sent a letter of protest to England complaining about the influx of lawbreakers. Given the conditions of chronic underemployment and want, the vast majority of crimes at that time were property crimes, sometimes accompanied by violence. Many imported thieves, however, finding opportunities available in the New World that did not exist in the old, managed to go straight and become productive citizens. Others, of course, continued their disruptive ways, to the consternation of the colonial population. The basic idea of capitalism is that one invests one’s capital resources in order to increase wealth. The idea is no different from what occurs today when people invest in the stock market, rental properties or businesses. People who put part of their earnings into 401(k) plans are practicing basic capitalism. The early colonial stock companies were based upon the same principle. Investors in the London company expected that the colonial economy would make a profit, and that they would share in that profit. The fact that many investment ventures could not prove to be profitable does not undermine the basic theory. Throughout history businesses have failed; companies have gone bankrupt; schemes and scams have cost investors millions upon millions of dollars; areas of the market that proved extremely profitable for a time eventually ceased producing wealth; but over the course of the years, wealth has been used to create more wealth, and putting money to work has always had an appeal to investors. Over the years people have tried to create formulas to ensure profitable investments, but capitalism is a human endeavor, and human beings, imperfect creatures that we are, do not always make wise decisions. As a result, the progress of capitalism has not been an upward moving curve, but rather a jagged line with highs and lows, rises and falls. For the early colonists the most reliable form of investment was to engage themselves in hard work. THEMES OF COLONIAL PERIOD: What do we take from our colonial ancestors? Much that is uniquely American derives from the colonial period. To start with, we should recognize that the development of America was rooted in competition. The notion of “social Darwinism”—the idea that the laws of nature, sometimes characterized as survival of the fittest, does or should obtain in political and economic society—has been discredited. Yet life in the early modern world was often about survival, and survival involves competition, both as a personal and family level, and at higher levels of political society. The early impetus for colonization in England was about competition with Spain and Portugal and later with Holland. In order to be great, England felt she needed colonies, not only in America but everywhere. The English had multiple goals: to produce, consume, and protect the British economy against weaker rivals, and to convert the heathens to Christianity by carrying out the missionary spirit. The English colonies were also exercises in an early form of capitalism, which is essentially the creation of wealth through investment. In his Out of Our Past, historian Carl N. Degler notes that "Capitalism came in the first ships." The growth of modern capitalism parallels the growth of America—in many ways America has been history’s most successful experiment in capitalism. That entrepreneurial spirit was seen not only in the investors who sunk their pounds into the chartered companies, but also in the colonists themselves. People in those times, not unlike today, wanted to improve the material quality of their existence, not so much out of greed or a desire to accumulate luxury items, but simply to make the bare survival for existence less burdensome. The joint stock companies hoped that by investing in colonial enterprises they might get rich quick through the discovery and mining of gold and silver. But the colonists quickly discovered, sometimes more rapidly than their proprietors, that the real gold in America was the land—land that produced tobacco, rice, timber, and later cotton and other crops. Thus when the promise of profits from gold and silver did not materialize, the companies declared dividends of land, their only asset. The great problem in Europe was finding enough land for the people: in America, the reverse was true. The fact that labor was scarcer than land made it worthwhile to trade land for labor, which constantly undercut European notions of class differences: In Europe landowners were aristocrats; in America, landowners were beggars. The quest for religious freedom is often stated as a motivating factor in the colonization of North America, but its exact nature is often misunderstood. Our concept of religious freedom today means that people of all faiths Christian, Jewish, Hindu, Muslim, or any other, including those who lack faith, should be free to follow their own religious inclinations without interference from others and especially not from the government. During a time of colonization England and the rest of Europe were in the throes of monumental religious controversies. The religious tension was more than just Catholic and Protestant; Puritans, Presbyterians, Quakers, Methodists, Baptists and others all had their own particular forms of worship and systems of belief. People who came to America in the 17th and 18th centuries were not seeking land of religious freedom for all so much as a land where they could practice their own form of religion free of interference from rival denominations. One overriding theme of religion in colonial America was hatred of everything connected with the Roman Catholic church. Thousands of people died in Great Britain in struggles between Catholics and Protestants, beginning with King Henry VIII’s replacement of Catholic Rome with his own Anglican structure, a conversion that was later rejected by his daughter Queen Mary, who clung tenaciously to her Catholic faith. When the Protestant Elizabeth came to the throne, she was constantly advised to be wary of Catholic suitors for her hand as well as Catholic threats to English sovereignty. That religious tension was carried into the colonies, as much of British colonial policy—such as it was—was directed against Spain. Catholic Maryland was an exception to religious exclusivity, but even there problems existed, as tension existed between Maryland and surrounding colonies. The famous Maryland Act of Religious Toleration passed in 1649 was repealed before very long. In a word, colonization involved exploitation—exploitation of human and natural resources. Life was fragile, and the first step people took before coming to America was often making a will. Colonization had a fearful price; it has been said that more people died as a result of colonization than perished on all the beachheads of World War II. In one single year in Jamestown, 80 percent of the population perished. Despite the hardships, colonization proved to be a study in the concept of the social contract: Survival conditions required contributions by all, regardless of birthright or other status symbols, and it eventually made republicanism and later democracy a natural solution to problems of government. The colonists were gradually liberalized—they got used to doing things their own way, all the while realizing that cooperation with others was necessary for survival. Experiments in communal living, however, failed. At the time Columbus discovered America millions of Indians had been living in the Western Hemisphere for tens of thousands of years. During the latter part of the Ice Age, a land bridge existed between Asia and Alaska across what is now the Bering Strait, and all evidence indicates that the Native American tribes migrated from Mongolia, through Alaska and Canada and eventually all the way down to South America, with some settling in favorable locations in the north and others moving on. Over time, they developed into distinct, separate Indian cultures. Thus North and South American Indians were extremely diverse, with varied physical traits, linguistic groupings, ethnic characteristics, customs, cultures, and so on. Indeed the Indians in North America were probably far more diverse than the people of the nations of northwestern Europe in 1500. In Central America the Aztecs had a large powerful empire, while along the eastern coast of North America Indians lived in smaller tribes and subsisted by both agriculture and by hunting and gathering. Farther south the Mayas and Incas had advanced civilizations that had progressed far in mathematics, astronomy, and engineering. In the western part of North America nomadic tribes roamed over the Great Plains in search of buffalo and other game and often came into conflict with other tribes over the use of their hunting grounds. When game became more scarce, perhaps due to over-hunting or from other causes, many American Indian groups turned to agriculture as a means of subsistence. In so doing American Indians became perhaps the best farmers in history, developing new crops and refining farming methods that they later shared with the colonists from Europe. Dozens of foodstuffs consumed in the world today, including corn, potatoes, various beans, squash, and so on, were developed by Native American farmers. When the European colonists first arrived, their survival often depended on their adoption of Indian hunting and farming practices. Indians also understood the use of natural medicines and drugs, and many of their healing techniques are still used by medical people today. Indian foods, especially corn and the potato, transformed European dietary habits, and in fact the impact of the potato on Ireland’s population was so great that it led to much of the Irish immigration to America in the 1800s. A thorough investigation of Native American cultures, even those in North and Central America, is an apt subject for lengthy study; the literature on pre-Columbian America is rich indeed. What is important to know is that Indian and European cultures affected each other profoundly, a phenomenon that has been called the Colombian Exchange—the exchange of habits, practices, living techniques, and resources between the Indians and the Europeans. The Native American cultures in the Western Hemisphere found their societies disrupted or even destroyed by the impact of the Europeans, some of which was deliberate, and some of which was a result of the transmission of diseases to which the American Indians were not immune. The introduction of firearms, alcohol, and other European artifacts also had deep and unpredictable effects. But the impact of the Indians on European culture was also deeply significant. For reasons that are not fully understood, some groups of Indians vanished without being affected by the Europeans. One such group were the Anasazi of the southwestern United States. They built spectacular dwellings in the cliffs in New Mexico; some of their settlements carved into the rocks contained hundreds of rooms. But somewhere around the year 1300 they left their rock palaces, never to return, for reasons unknown. Anasazi link. Ironically, in North America the presence of the native cultures made it possible for the first English settlers to maintain a foothold on the new continent. The Jamestown colony and the New England Pilgrims certainly owed their mere survival to the help and assistance of Indians. The Indian cultures that the Europeans encountered were in many ways just as sophisticated, or in some instances even more sophisticated, than the European cultures that arrived in the first ships. The Indians never thought of themselves as inferior to whites; in fact, the opposite was often the case. The arrival of the Europeans also upset the balance of power among the North American Indian tribes, both in the eastern woodland regions and later on the Great Plains and in the deserts of the Southwest. Europeans frequently had a romanticized view of the Indians as “noble savages,” and some Europeans believed them to be one of the ten lost tribes of Israel. In eastern tribes women frequently held power, and in fact some were tribal chiefs. Europeans often rated Indians as inferiors, which then justified their harsh treatment of the Indians later on. Probably the greatest misunderstanding between Europeans and Indians was their differing concepts of land, or land ownership. The European believed that you could drive four stakes in the ground, parcel off a square of land, and claim ownership of that piece of ground. Such individual ownership of a section of land was completely alien to the Indian way of thinking. Certainly Indian tribes fought over the use of land on which to hunt or fish or even practice agriculture, though the agricultural tribes tended to be less warlike than hunting tribes. But the idea of “ownership” of land was something they did not understand. For some Indians the land itself was sacred, held as a mother goddess. For many Indians the idea of plowing soil to plant crops was as good as blasphemy, and many aspects of nature—rivers, ponds, even rocks—performed similar functions as the saints in Christian cultures. Even after they had made deals with the Europeans for the purchase of land, the meaning of what they had done was often unclear and led to further conflict. Many Indians tribes were traders and had built complicated economic relationships with their neighboring tribes, so they understood the idea of commerce as is existed within their own system of barter and exchange. The European impact on this trading culture was often destructive, however, as the Europeans sought to trade and exchange different kinds of goods from what the Indians were used to. The nature of warfare also illustrated cultural differences and heightened the conflict between Europeans and Indians. Native Americans fought hard, and the ability to sustain pain and suffer physical punishment with stoicism was a sign of honor. The loot in Indian warfare was often the capture of women and children of enemy tribes, especially when the population of an aggressor tribe was threatening for some reason. Thus many Europeans saw Indian ways of warfare as primitive and barbarous, while Indians in turn thought European practices such as hanging were destructive of the soul. Despite all the conflicts, in certain ways the Indians benefited from the contact with the Europeans. The horse, for example, had become extinct in North America long before the Spaniards arrived. But when the Spaniards brought their superior breed of Arab horses to North America, within a few generations the Indians of the Southwest had taken to the horse with amazing speed. The horse transformed the culture of the Plains Indians almost immeasurably; consider the difficulty of tracking and killing a fast-moving buffalo on foot, compared with the ability to run down one on horseback. Plains Indians became the greatest light cavalry in the history of the world. Armed with rifles or bows and arrows, Plains Indians could hold their own against any cavalry detachment anywhere on the open plains. That they eventually succumbed to the superior military power of the United States was less a factor of individual skill than it was of organization and numbers. The history of the interaction between the Indians and whites begins with Columbus, and the story is a long, tragic tale of greed; relentless pushing, shoving, and grabbing of land; insensitivity; xenophobia; and even genocide. The cultural differences between Indians and Europeans and their American descendants continue to this day. As we go through the history of Americans and the United States, we will pick up the thread of this story again. Culture Clash: Native Americans were seen in various ways: The “noble savage” was a common characterization, though others thought of them as barbarians. Some religious groups saw the Indians as the lost tribes of Israel. Both sides took from each other—both good and bad—in what became known as the “Colombian exchange.” In the end, tragically but almost inevitably, the Indians were the losers in the colonial and later revolutionary experiences. The conflict between Indian and white society has continued into modern times. Probably the most important point in considering the development of America was that the North American English as well as other European colonists were freer than their European counterparts. The colonists were European in character but were nevertheless different; early on they developed a sense of independence and to a certain extent contempt for authority. Americans did not have the luxury of holding onto the old ways because of “tradition”; they had to go with what worked. Flexibility was an American characteristic. The frontier experience tended to favor individualism and a certain egalitarianism. It mattered less who your parents were than how well you could survive. It is not easy to make the case here in the 21st century that the colonial American experience influences the way we live today. There can be no doubt that events since the turn of the millennium in the year 2000 have shaken our perceptions of our place in the world. Nevertheless, the past is still part of us; our roots are deep. And no matter the origins of our most recent wave of immigrants, men and women who come to America inevitably become connected with our history. For many, in fact, the opportunity to achieve the connection with our deepest roots is the reason why they have come.